Toshiba Transmission & Distribution Systems group is a world leader in the supply of integrated solutions for energy Transmission & Distribution. Our systems effectively control Transmission & Distribution in order to deliver reliable electricity from Power Plants to factories, Transportation Systems and even Our Homes. Toshiba has developed its superior technology and has a history of high product quality in this market throughout the course of more than 100 years, manufacturing its first transformer in 1894 and its first switchgear in 1902. Our vast experience & continued expansion has allowed us to gain immense trust and appreciation from customers around the world. We strive to create products and services that enhance society and protect the environment. This is accomplished through a single component reducing environmental impact or a complete smart grid solution. 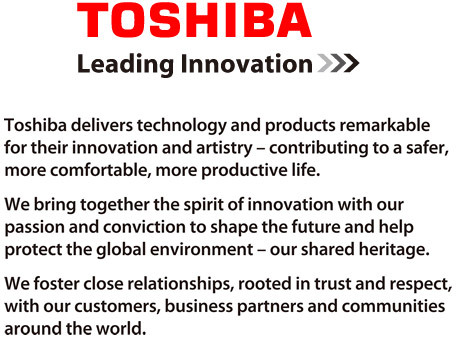 Toshiba continues to serve the people and the planet that we call home. Toshiba Corporation , Japan has acquired the businesses of Power Transformers, Distribution Transformers & Switchgear from Vijai Electricals Limited, Rudraram works, Hyderabad, Andhra Pradesh in December 2013 and thus formed, Toshiba Transmission & Distribution Systems (India ) Pvt. Ltd. (TTDI). TTDI will emerge as the global production hub of Toshiba Corporation to cater product & component requirements across the world. To be the leading Global Transmission & Distribution Systems Company. We, Toshiba Group of companies, based on our commitment to the society and the future, are determined to create a higher quality of life for the society, and to do our part to ensure that progress continues within the world community. We endeavour to serve the needs of the society, especially our customers, share holders and employees, by implementing forward-looking corporate strategies while carrying our responsible and responsive business activities. As a good corporate citizen, we actively contribute to further the goals of society. By continuously developing innovative technologies centering on the fields of Electronics and Energy, we strive to create products and services that enhance human life, which lead to a thriving healthy society. We constantly seek new approaches that helps realize the goals of the world community, including ways to improve the global environment.